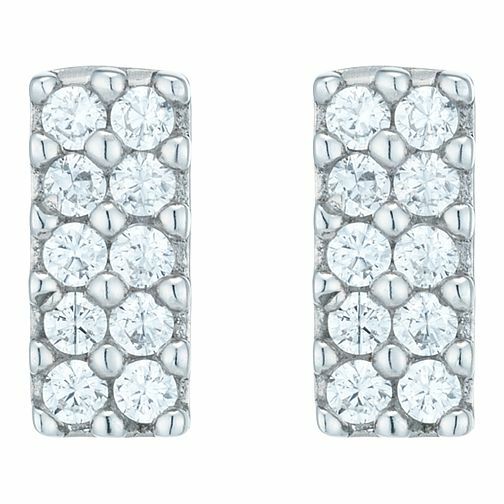 A delicate bar stud earring, crafted in shining sterling silver and set with sparkling cubic zirconia for a glamourous feel. Perfect for every occasion. Sterling Silver Cubic Zirconia Set Bar Stud Earring is rated 2.0 out of 5 by 2. Rated 3 out of 5 by Anonymous from Great earrings! Simple and perfect for any occasion. These earrings we're bought as a gift, the recipient really likes them. The size on the photo may be misleading but is indicated in the 'will it fit photo'. The detail really suits the size and looks amazing in the right lighting.